Written below are lists containing the craft supplies, games, supplemental materials, and books suggested throughout the 4 Year Curriculum. While the lists may seem daunting at first, I believe that you will find the vast majority of the supplies already in your home. If they are not, I suggest that these items be available for your child to use and play with to expose your child to many textures, activities, books, and play. Items are divided into categories to make them easier to find and linked to Amazon so that you view a picture of each item. Most of these items should also be available at your local supermarket but may be substituted with other items on hand. 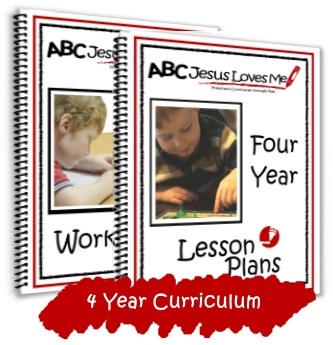 View the 4 Year Lesson Plans to see how each item is used. Again, do not get overwhelmed by this list. Substitute items with what you already have in your home. Week 4 Pete the Cat: I Love My White Shoes, Click, Clack, Moo: Cows That Type, There's a Wocket in My Pocket! _______ The Bible songs chosen in this curriculum are old "Sunday School" favorites and are added to heighten the curriculum. I have tried to choose ones that are familiar to most but if the song is not known any Bible song can be used. Most songs can be found on Amazon through MP3 download or on several Bible Songs CDs available to purchase. DVD's - These DVD's are all optional. _______ Veggie Tales - Are You My Neighbor? _______ Veggie Tales: God Wants Me to Forgive Them?